Hidden Man Purse Week continues today with a rugged, sporty, and flexible option for keeping your man-purse habit a closely guarded secret. Meet the Covert Harness Bags from the wild and daredevilish folks at Civilian Lab (the makers, you’ll remember, of the Tintin Wallet). There are eight configurable models to choose from, but we like the Covert_Lite Specialist LT, in part because the name brings a James Bond-like flair to what otherwise might prove a rather humiliating experience: dressing up in a harness to hide your handbag. The Covert bags are a holster system based on a strappy getup that can be worn six different ways. 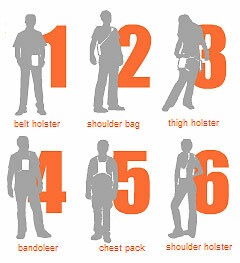 We love Civilian Lab’s clever little diagram of the hidden-handbag possibilities: there’s a belt holster, a shoulder bag, a thigh holster (men: we dare you), a bandoleer (there’s something Freudian about their chosen spelling here, we think), a chest pack, and a shoulder holster. We like the chest-pack configuration best, because there seems something so “in your face” about it — especially, we suppose, if you’re someone of short stature and you’re facing a person who’s wearing one. 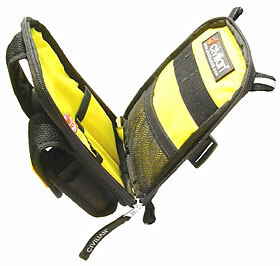 Wear your Covert bags under a jacket, or (for you real daredevils) out in the open. 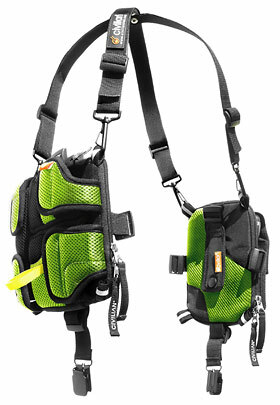 Most models come with two separate multipocket pouches that attach to the harness. The Specialist comes with a “business” bag that accommodates a PDA or similar device with accessories in an outside pocket and plenty of space for keys, maps, and other confidential booty inside, plus a smaller “utility” bag for your secret spy toolset. Both are made of “breathable air-mesh” and nylon and come in four colors: black, flare, glacier, and — oh, yeah — frog. This entry was posted on Tuesday, April 4th, 2006 at 2:33 pm	and is filed under Bandoliers, Chest Packs, Electronics, Gadget Bags, Handheld Bags, Hip Bags, Holsters, Man Bags, Manufacturers, Shoulder Bags, Small Purses. You can follow any responses to this entry through the RSS 2.0 feed. You can leave a response, or trackback from your own site.